I love iHerb and whenever they contact me about reviewing a product or hosting a giveaway, I am quite pleased to do so. iHerb carries over 25,000 products: their online catalog is filled with everything from herbal supplements, cosmetics and personal care items that are organic and/or cruelty-free to specialty grocery items (many of which are vegan, vegetarian, gluten-free, and organic). Their prices are terrific and they offer free domestic shipping if you order more than $40 worth of goods. iHerb is my go-to source for many of the gluten-free flours that I use because they have a better selection and better prices than my local shops. It’s also where I buy my Garden of Life virgin coconut oil whenever I run out. iHerb asked me to share my opinion of a Madre Labs product called Cocoa Cardio, which is made from organic cocoa and beet juice powders, as well as hibiscus extract. This product is a chocolate powder that’s healthy because it contains a high amount of free radical scavenging flavanoids; it’s meant to be taken daily to support cardiovascular health. I followed the instructions on the package and tried a scoop in hot water, sweetened with a little maple syrup. As the package states, it is a little bitter: I personally preferred it with a little organic cream added. I also tried it in a banana peanut butter smoothie and found that it adds a nice dark chocolate flavor. iHerb has offered to send one of my readers a package of Cocoa Cardio, and they’ll give you a $50 credit toward a shopping spree at the site, as well. For a second entry, follow me on twitter and leave me a comment letting me know you did (or let me know that you are already a twitter follower). For a third entry, like my blog on facebook, then leave me a comment letting me know that you do (again, if you are already a “liker”, just leave a comment telling me so). This giveaway is open to everyone, and you must register at iHerb in order to be eligible to win. If you are an international winner, you will be responsible for paying any additional customs duties and brokerage fees. The giveaway closes next Monday (8/1/11) at midnight. I’ll select a winner using random.org and again, you’ll get a package of Cocoa Cardio plus a credit toward $50 of iHerb products, plus free shipping, if you win. Good luck! ps If you don’t win (or if you just can’t wait) and you’ve never shopped with iHerb before, you can use the code GAP735 to get $5 off your first order! Disclosure: iHerb sent me Cocoa Cardio to review; they also gave me a store credit in exchange for hosting this giveaway. All opinions shared about Cocoa Cardio and iHerb are 100% my own. I am registered at iherb! Thanks for a great giveaway! I have been a very satisfied customer at iherb for a long time! I follow Winnie on Twitter. I’ve been an iHerb devotee for quite some time! And I already follow your blog on Facebook! Registered at iHerb! Great giveaway! Of course I already follow you on twitter! I’m registered at iherb! great giveaway! Hi! I´m registered at iherb too! Registered already – I love iherb! Was already registered @ iherb (does that count?). Love that store! Following you on twitter now! What a fun giveaway. 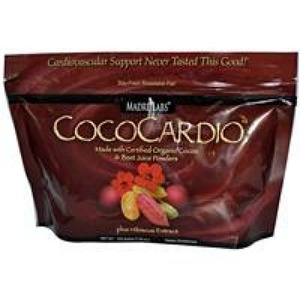 I am so interested in trying the cocoa cardio now! i entered this already last week, but none of my entries are showing up! so will try again.. I am registered at iherb! i am a follower on twitter for some time!